The Mellotron was in production from 1963-1986, then revived by Streetly Electronics in 2007. Though initially conceived as 'The Chamberlin' by American Harry Chamberlin, there's something entirely British about the Mellotron. Indeed, the first instrument to carry the name was British born, a product of a meeting between Chamberlin's sales agent Bill Fransen and the Brothers Bradley (Frank, Norman, Les) of Bradmatic Ltd, a tape engineering firm. The Bradleys had ideas about how to improve Chamberlin's design and, joined by TV star David Nixon and bandleader Eric Robinson, they formed a company - Mellotronics - to put those ideas into play. The initial Mellotron Mk I was issued in 1963, quickly followed by the Mk II for the whopping sum of £1000 - about half the price of a house at the time! The Mellotron made use of rows of tape - one for each of its keys - that were dragged across a tape head every time a note was played. The left-hand manual provided rhythms, while the right provided sounds that were hard to come by for most musicians: strings, choirs, woodwinds, etc. It was a brilliant idea, but unfortunately, Mr Fransen hadn't 'fessed up to not being its proprietor! After some contentious back and forth with Chamberlin, a deal was made that allowed both him and the Brothers Bradley to pursue the technology. The Bradleys subsequently changed their company's name to the now-familiar Streetly Electronics in 1970, producing the most familiar version, the single-manual M400. Notable Mellotron users include Genesis, the Moody Blues, King Crimson and, of course, The Beatles. The M400 was instantly recognisable in stark white finery. Smaller than the Mk II, it offered musicians the option of switching out tape "frames" for alternate sound sets. Some famous users - Roxy Music and Tangerine Dream come to mind - opted for custom tapes, though it was nevertheless hard to avoid the "Mellotron sound": scratchy, noisy, and limited to around seven seconds of playback before the mechanism was required to be reset. This forced users to develop a fluid playing style to compensate for the time limit. Notable Mellotron users include Genesis, the Moody Blues, King Crimson and, of course, The Beatles. 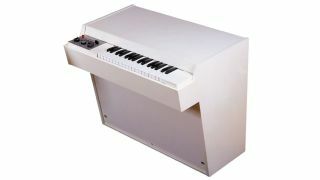 The Mellotron's predecessor, the Chamberlin, was used by David Bowie on the so-called "Berlin trilogy" of Low, Heroes and Lodger, as well as Scary Monsters. Later Mellotron users included Oasis, Radiohead and Spock's Beard. Needless to say, a mechanical behemoth like the Mellotron was difficult and expensive to maintain. It was Tangerine Dream's Christopher Franke who suggested that Mellotronics produce a digital alternative, which they did in 2010 - decades after sampling had made the Mellotron obsolete. The Mellotron was always all about the sound, and that sound is pretty easy to come by via the many free and commercial libraries available for various samplers hard and soft. There are dedicated plugins devoted to reproducing the sound and behaviour of the original, not least being the fabulous M-Tron Pro from GForce. If you absolutely must have the real thing, you can still get one from Streetly Electronics. Today's M4000 offers a single manual, 24 sounds and costs upwards of £4500 - about a 50th of the price of a house! If you're short of cash, you could do a lot worse than MELLOTRON Premier. Flute, strings and cello samples from an original M400 are splayed across 35 keys, each sound seven seconds in length. Kontakt, EXS24 and Structure samplers supported. Another freebie, this one offering a slightly different set of tapes, the SynthEdit-made Tapeotronic is Windows-only, and provides flute, strings and chorus sounds. You get 16 patches in total, and fully automatable knobs for attack, release, tone, tune and volume. Well worth the asking price!